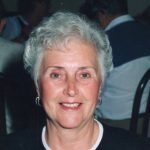 Clarabelle (Penny) Scheick, 86, of Houghton Lake, formerly of Brooklyn, passed away Sept. 24, 2018, at Houghton Lake. Penny was the daughter of Garrett and Sushanna (Stinger) Crawford. She married Robert B. Scheick of Hillsdale May 20, 1951. She is survived by two sons, Robert L. (Susan) Scheick and Mark D. (Diane) Scheick of Brooklyn; five grandchildren, 9 great-grandchildren and two on the way. She worked for the Brooklyn School District for many years, retiring in 1991, and was a long-time attendee of the Brooklyn Presbyterian Church. She loved to sew, spend time at the lake, and, most of all, her grandkids. Family was the most important thing to her, and she will be greatly missed by all. Funeral services will be held Friday, Oct. 19, 2018. Visitation will be held for family and friends at 11:30 a.m. and the service will begin at 12:30 p.m. at the Brooklyn Presbyterian Church with Rev. Jake Koffman officiating.